BotF was delayed getting out of the office in Melbourne and was bumped to a late flight. Took the opportunity to try another North Melbourne establishment. First attempt – the Experimental Duck aka the Sir Robert Peel – shut down. Second attempt – the Royal Park – shut down. Third and now thirsty attempt – Central Club – at least a going concern but shut in the evening(!). 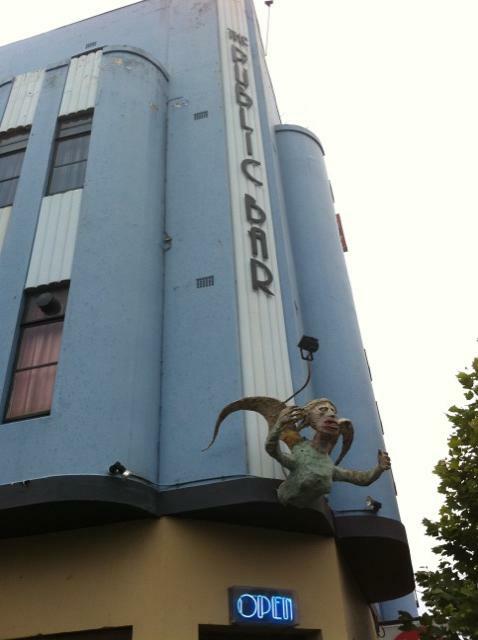 After turning away from the Central in disgust, I was ready to curse North Melbourne when I saw the awesome entrance to The Public Bar jut out from a powder blue Art-Deco facade. This place is a keeper and will be visited again. Definitely overdressed in a suit, I’d look forward to a night in black watching a band. The Thrusts were on tonight. I’d be looking to book Snaketide to this venue. The Royal Park hasn’t shut down – it just does a very good impression of looking like it has.